As always things have been busy in the world of WTMC this month, particularly on the training front. Club members have variously attended first aid training, a pack-rafting safety course, canyoning abseiling basics and we’ve got river safety training coming up this weekend too. Many thanks to those involved with organising these training sessions and to those who are keen to extend their skills. Last weekend a group headed up to the Ruahine to the club trap line. This trip was more than the usual checking and re-baiting of the existing traps as the team were installing new A24s along the line, so we now have even more trapping power! Good luck to WTMC members Nick and Elisabeth who are heading south to attempt to climb Aoraki Mt Cook after a long season of building up their skills and fitness. Climb high and stay safe – we look forward to hearing about this adventure at one of our club nights in the new year. Hopefully you’ve already got your order in if you want a hard-copy of the 2018 WTMC Journal. Those who pre-ordered will be able to pick them up from club at the Social Night on 12 December and posted copies will be sent around that date if you provided your address. Some additional print copies will be available for $25 on 12 December if you missed the order deadline. The online version will be made available in the new year. I’ve heard from the proof-reader that the stories are well worth a read! WTMC is volunteer run so we’re always on the look-out for members to help out with various tasks to keep the club running smoothly. Sweep out vans, along with clear debris. General make sure the inside is tidy. Take the van to the van wash – The Z at Waterloo Quay fits ok with the mirrors in. (Optional) Vacuum inside of the van, makes it look nice but lots of nooks to deal with. Just let zn.gr1556282355o.cmt1556282355w@tro1556282355psnar1556282355t1556282355 know if you are keen. Easy As! Applications are still open for WTMC Scholarships. Members who meet the eligibility criteria are encouraged to apply. Preparing your nutrition for a long summer trip? Remember the club now has a dehydrator which can be hired. Contact zn.gr1556282355o.cmt1556282355w@ret1556282355telsw1556282355en1556282355 for more details. Don’t forget we now have a few emergency mountain shelters in the gear cupboard. These are ideal for day trips where you might be on exposed tops. Wednesday club nights take a bit of a break over Christmas. This month I’ve been on my first canyoning trip with the club. 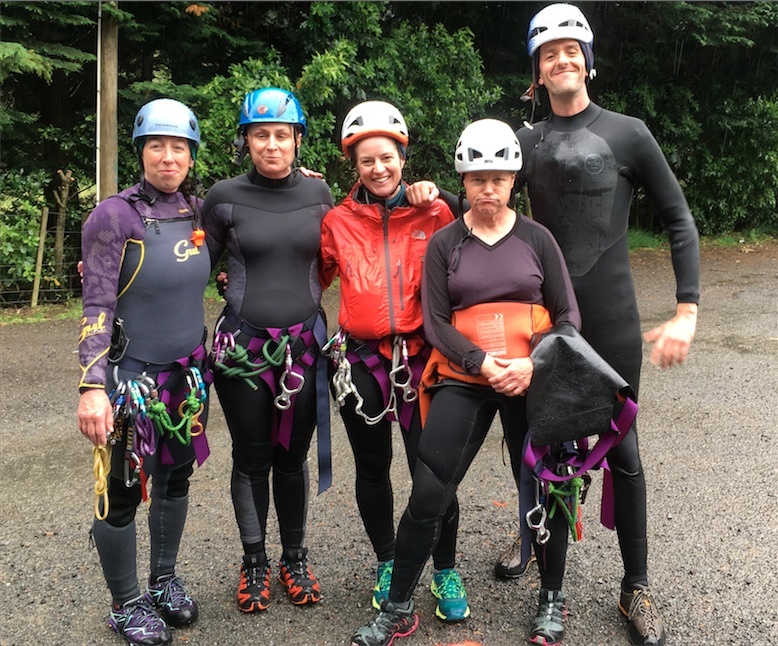 Last Saturday a group of us descended Little Akatarawa which made a jolly little local outing for a Saturday and gave me my first taste of abseiling through a cold torrent – invigorating let’s say! The previous weekend I found myself on a last-minute unscheduled trip to Taranaki in the hope of getting my crampons a final work-out before the end of the season. Before I knew it we’d decided to climb overnight to make the most of the fine weather – by 7am on Saturday morning we were breakfasting in the summit crater having witnessed the sun rising during our ascent and not quite believing we’d pulled off such a crazy idea. See the rest of the newsletter for write-ups of both these adventures. Next time you hear from me it’ll be the end of January and you’ll hopefully have lots of tales of Christmas tramping adventures to share. Happy Christmas and stay safe whatever adventures you are planning.